Author(s): Amjad Farooq. Department of Biochemistry & Molecular Biology, Leonard Miller School of Medicine, University of Miami, Miami, FL 33136, USA. Estrogen receptors, comprised of ERα and ERβ isoforms in mammals, act as ligandmodulated transcription factors and orchestrate a plethora of cellular functions from sexual development and reproduction to metabolic homeostasis. 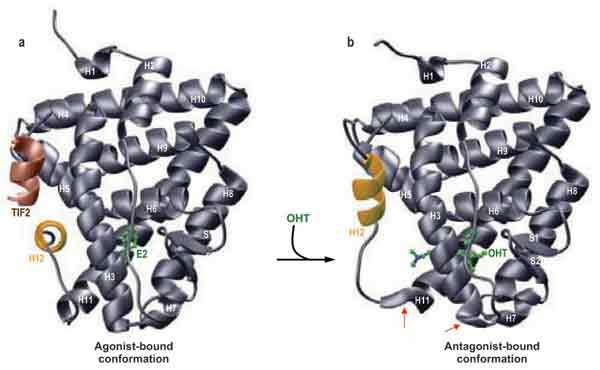 Herein, I revisit the structural basis of the binding of ERα to DNA and estradiol in light of the recent discoveries and emerging trends in the field of nuclear receptors. A particular emphasis of this review is on the chemical and structural diversity of an everincreasing repertoire of physiological, environmental and synthetic ligands of estrogen receptors that ultimately modulate their interactions with cognate DNA located within the promoters of estrogenresponsive genes. In particular, modulation of estrogen receptors by small molecule ligands represents an important therapeutic goal toward the treatment of a wide variety of human pathologies including breast cancer, cardiovascular disease, osteoporosis and obesity. Collectively, this article provides an overview of a wide array of small organic and inorganic molecules that can fine-tune the physiological function of estrogen receptors, thereby bearing a direct impact on human health and disease. Keywords: Endoestrogens, Estrogen receptors, Metalloestrogens, Phytoestrogens, SERMs, Xenoestrogens. Affiliation:Department of Biochemistry & Molecular Biology, Leonard Miller School of Medicine, University of Miami, Miami, FL 33136, USA. Keywords:Endoestrogens, Estrogen receptors, Metalloestrogens, Phytoestrogens, SERMs, Xenoestrogens. Abstract:Estrogen receptors, comprised of ERα and ERβ isoforms in mammals, act as ligandmodulated transcription factors and orchestrate a plethora of cellular functions from sexual development and reproduction to metabolic homeostasis. Herein, I revisit the structural basis of the binding of ERα to DNA and estradiol in light of the recent discoveries and emerging trends in the field of nuclear receptors. A particular emphasis of this review is on the chemical and structural diversity of an everincreasing repertoire of physiological, environmental and synthetic ligands of estrogen receptors that ultimately modulate their interactions with cognate DNA located within the promoters of estrogenresponsive genes. In particular, modulation of estrogen receptors by small molecule ligands represents an important therapeutic goal toward the treatment of a wide variety of human pathologies including breast cancer, cardiovascular disease, osteoporosis and obesity. Collectively, this article provides an overview of a wide array of small organic and inorganic molecules that can fine-tune the physiological function of estrogen receptors, thereby bearing a direct impact on human health and disease.